Unitus Ventures (formerly Unitus Seed Fund) is excited to announce that we’ve made a seed investment in VillFarm based in Chennai! This is our 4th seed investment in 2012. 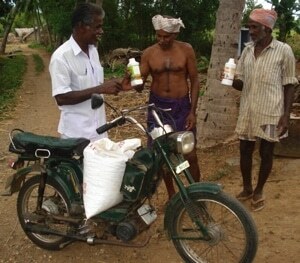 VillFarm is building an innovative last mile rural distribution business starting in the South Indian state of Tamil Nadu. They are focused on distributing affordable, high value-add agriculture and dairy input products which increase the income of small and marginal farmers. They’ve created a low-cost, two-tier distribution system with feeder warehouses connected to village-based independent sales agents (called Village Level Entrepreneurs or VLEs) who also provide advisory services to farmers about how best to increase their crop yields. I first met VIM CEO, Ashutosh Sinha and VillFarm founder, Paul Basil in Q1 2011 as they were winding up the 2010/2011 fiscal year of VIM’s operations. They were gaining some good learnings from their initial pilots including what products customers were interested in, how to find/hire/train/support their VLE sales agents and what the initial unit economics were looking like. I was impressed with their innovation. Alas, we had not yet launched Unitus Ventures (formerly Unitus Seed Fund), so we weren’t at a place to consider a seed investment. When we re-connected late in 2011, VillFarm had made a lot more progress. Some of it was painful though. Because they had run low on cash, they had been forced to consolidate some of their operations and, as it turns out that in many ways, this was a blessing in disguise. I remember Paul Basil telling me that it was good that they hadn’t raised money earlier as it forced them to focus very closely on optimizing operating costs and as a result were able to demonstrate financial break-even at the unit level. They had to merge multiple roles and found out that they could operate fine under the new, more frugal model. We were able to visit VillFarm’s field operations in Tamil Nadu in January and were impressed with their team, their operations and the VLEs that we met. We told Paul and Ashutosh, “We’re interested in investing, but we need another co-investor to complete this seed round.” We talked with a number of potential investors who weren’t able to move quickly on an investment decision. Then we met a group of angel investors whom we connected with immediately on investing expectations and philosophy. We all saw the huge opportunity that VillFarm has to bring improved prosperity to millions of small farmers in India. Why are we excited about VillFarm? 1. Great Team. Ashutosh and Paul have put together a great team. They’ve worked hard on experimenting to find a breakthrough formula for this high potential but challenging business category. And now they’re ready to take it to the next level! 2. Direct and Immediate Impact. Small farmers who utilize VillFarm’s products improve their farm income very quickly. We talked with the farmers and they vouched for this result. And that’s why they LOVE the affordable, hand-selected agriculture and dairy input products that VillFarm sells. Also, VLEs can very quickly generate additional income. We love businesses which improve livelihoods like this! 3. Scale Potential. Rural distribution is hard. And the operating margins are low. So, despite many attempts by small and huge companies to crack the rural distribution “formula”, there hasn’t been a lot of success. One of the big issues is creating a low-cost, efficient channel. VillFarm’s VLE model is showing a lot of early promise that can be scaled up in a mostly variable cost manner. The VLEs are happy (and therefore engaged) as they’re earning supplemental income. And they have products to sell again and again to farmers so they have a high life-time value of each of their customers. Unitus Capital acted as a financial advisor to Unitus Ventures (formerly Unitus Seed Fund) on this investment.